n any study of Atlantis the primary source of analysis should begin with the only ancient records available on the subject. These are the two records written by Plato titled TIMAEUS and CRITIAS. In these two books Plato gives a detailed description of the Island of Atlantis including the geography, structural features, cultural aspects and industry. If indeed Atlantis did exist then the details provided by Plato are to be taken as the benchmark for comparison. One must keep in mind however that Plato himself wrote about Atlantis perhaps 1,000 years after Atlantis ended as a significant civilization. This then could mean that even Plato himself misunderstood the accounts of Atlantis. My hypothesis is that Atlantis was a powerful state that was based on the island of Sardinia in the Western Mediterranean Sea. This powerful state was most fully developed in the pre Bronze Age and the early Bronze Age, say about 2000 BC to 1400 BC. These dates are supported by A. G. Galanopoulos' adjustments to Plato's time period for Atlantis. *1 (This time period will also be in accordance with other conclusions of this thesis.) It is also my belief that Atlantis controlled much of the rim of the Western Mediterranean and even made attempts to conquer the highly developed states of the Eastern Mediterranean including; Mignon Crete, early Hellenes Greece and Egypt. This would mean that Atlantis was primarily a sea power. Perhaps the earliest great sea power in history. But according to Plato Atlantis was defeated in their invasion attempt of the East by a combination of the Athenian navy and major earthquakes and floods. *2 Together these forces lead to the destruction of Atlantis as a major power. The defeat of Atlantis caused a major set back in the development of the cultures of the Western Mediterranean. However with new research the history of the Western Mediterranean may prove to be much richer than previously thought. First lets review the confusion as to the whereabouts of the island of Atlantis. Plato tells us that Atlantis was an island located in the Atlantic Ocean beyond the Pillars of Hercules. And that this island was larger than Libya and Asia together. He also tells us that there was a chain of islands leading from Atlantis to the West. And that these islands stretched towards a great continent which surrounded the island of Atlantis in all directions. *3 The main problem in accurately placing Atlantis according to Plato's description is that one must realize the perspective difference between Plato's Classical Greece of 450 BC and that of the earlier Hellenistic Greece of around 1500 BC. By Classical Greek times most of the Mediterranean world was well known to the Greeks and the Atlantic Ocean was considered outside of the straits of Gibraltar, known to the Greeks as the Pillars of Hercules. This view of the world is of course our own today. But even in Classical Greece the perceptions of the known world varied greatly from that of the modern age. Herodotus in The Histories was aware of the island of Sardinia. He however refers to Sardinia as being the "biggest island in the world. " 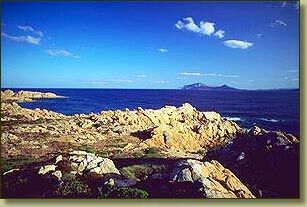 *4 Yet today we know that Sardinia is in fact smaller than even its' southern neighbor Sicily. *5 Even by 98 AD Tacitus still referred to the Atlantic Ocean as "the unknown sea." *6 Therefore surely 1,000 years before Plato's time the early Hellenes may have had a much different outlook of their world. If we were to assume that the Western Mediterranean was unknown to the Hellenistic Greeks then Sardinia would fit Plato's description of Atlantis all too well. First move the Pillars of Hercules back from Gibraltar to the Straits of Messina located between the Southern tip of Italy and Sicily. Sardinia is a large island beyond the Straits of Messina. There are the Baleares, a chain of islands from Sardinia leading Westward. And a great continent surrounds Sardinia if together we include Spain, France, Italy and North Africa. 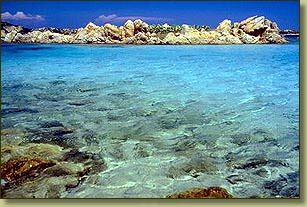 Now lets look at the specific details of the island itself from Plato and compare these to the island of Sardinia. For this comparison however we must refer to the geography of ancient Sardinia of around 1500 BC. These examples show how ancient and modern Sardinia matches very well with Plato's descriptions of Atlantis. Unlike any other place in the world!! It is my hypothesis that the Nuraghi culture, the "Keftiu" and the Atlantis of Plato are all one and the same. And that the archaeological remains that exist on Sardinia are in fact the remains of the Atlantis civilization. The only piece of the puzzle that remains is the myth that Atlantis sunk to the bottom of the sea. For that explanation the world must wait until new evidence can be discovered to support or discredit this myth. An expedition has been proposed to the island of Sardinia for the purpose of investigating the possibility that there are in fact ruins off the coast of Sardinia similar to that of the Nuraghi civilization which are found on the land. If you would like to assist in funding this expedition click here. 1. Ramage, Edwin S. ed. Atlantis Fact or Fiction? Bloomington and London:Indiana University Press, 1978, p. 41. 2. Plato, Timaeus: The Dialogues of Plato, Translation by Benjamin Jowett;Great Books of the Western World. Chicago, London and Toronto: EncyclopediaBritannica, Inc. 1952, p. 446. 4. Herodotus, The Histories. New York: Penguin Books, 1954, pp. 109 and 389. 5. Encyclopedia Americana. Vol. 24. New York: Americana Corporation, 1963. P. 299. 7. Plato, Critias: The Dialogues of Plato, Translated by Benjamin Jowett; Great Books of the Western World. Chicago, London and Toronto: Encyclopedia Britannica, Inc. 1952, pp. 483 and 484. 8. Encyclopedia Americana. P. 299. 10. Guido, Margaret. Ancient Peoples and Places Sardinia. New York: Frederick A. Praeger, 1964. P. 28. 11. Balmuth, Miriam S. The Nuraghi Towers of Sardinia. Archaeology Vol. 34 Mr/Ap. 81. P. 42.